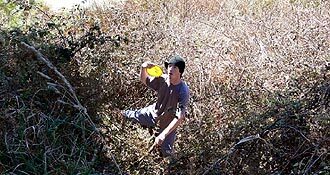 We are not going to give you a long, in depth, story of the amazing weekend that was the 2006 Taupo Classic Disc Golf Championships. 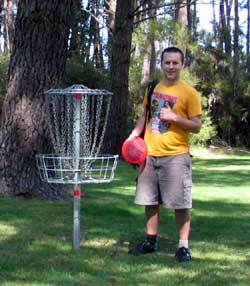 With the combined team of regular www.discgolf.co.nz photoman Len Skap and newcomer Meg A Pixel (do we see a romance forming behind the lens? - ed), we'll let the pictures speak...er, lets work that out...if a picture tells a thousand words and we are showing you thirty pics, that's 30,000 words = 18 hours of commentary. Phew! 'Don't Roll!' - Taumarunuian golfer Des Cooper fired a great drive here on the tough 1st hole. After seeing many round crippling rollers, Des hopes that he can sit his second shot on the ground alongside the basket. This is the hole that Simon Feasey caught up 3 shots - yes 3 shots to the leaders Bob Gentil and Blair Joined in the first hole of the last round. The rest became history. Release!... - Matt Cutler (UK) commands his disc to turn against its normal fade as seasoned kiwi golfers Pete Boyle and Baz Keene watch on hole 12. A very tough hole for the righties, the twelfth features a sharp dogleg that is difficult to maneuver around. And if that ain't enough, there is the sloped green that is so hard to settle your disc on to. We have seen quite a few disasters here over the short history of this course. This shot was taken only moments away from Matt's awesome ace on 13. Bombin' In! - Juan Unda (Mexico) has shown a masterly touch on the second, recording birdie after birdie - as well as one solid chain hit, only to see it bounce out and roll. Unlike Dean Marshall (Tauranga), who aced this one in 2004. Ace Cutler - Congratulations to UK golfer Matt Cutler for an incredible hard-struck ace on the 13th, taking away over $70 prize money from the Ace Pool. We heard him lamenting that he didn't have his old bent favourite for this hole, so he'd have to throw his relatively new [wot disc woz dat Matt?]. At the tee he made his usual run up, firing a bullet-like shank for the ol' S-bend throw. It looked good from the outset - Baz, who was spotting for any unlucky pinball tree hits into bracken, was not sighted for the basket. So when they heard a kaching - all players were running! The optimistic solidity of the 'kaching' was spot on - we had the second ace in as many Tour Events! Just as well we got this shot of the special disc just after the Ace - Matt lost it on the very next drive! On The Beat Pete - Pete Boyle (Taumarunui) comes back from shoulder injury to slot back into his usual great form with wickedly accurate forehand for both long and short shots. Throw Like An Egyptian - Here Pete Boyle (Taumarunui) gets in a lean that almost has his ear to the ground to ensure a bomb on the second hole around the bunker-like trees..
Aeeeergh! - Auckland golfer Nigel 'Waiheke' Hailstone shows despair during a seemingly endless 5th hole where a stray drive saw him back at the tee after 3 shots with 170 metres to go!! Maybe it was that 2 litres of Pepsi Cola you were carrying Waiheke! Stop Playin' Around! - Nigel 'Waiheke' Hailstone (Waiheke) found himself having to get flexible in the playground to play his third shot on the ever tough 4th hole. Excuse Me? - An interesting view of the top group from the 1st hole tee. We see golfing legend and eventual tournament winner Simon Feasey (Auckland) playing his second shot after an enormous drive on the fifth hole - Simon tells us he fired a shocking 7 here with some poor putting. Shooting over par on the fifth would be a common story - partly due to the long long 170m from tee to basket..
Stylin' ... - Paul Cohen (Waiheke) is all style at the first tee in beautiful conditions at Spa Park. With youthful strength like this, we had to ask for his drivers licence for proof of his Grand Master status! Birdie Thank You! - Waiheke-come-Aucklander Nigel Hailstone moves with his disc in his unique animated manner - more of that to come! 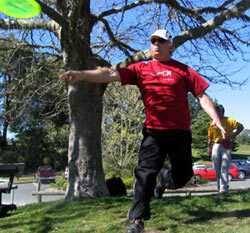 But the Hailstone brothers Nigel and Brett are a pleasure to watch putting - they fly their disc confidently high at the chains in a manner indicative of their disc golf growth around baskets at Waiheke's permanent basketed course. Carson Booming ... - Wellington thrower Carson Boon returned to Spa Park after impressing in 2005. And it was like he had found even more horsepower! Here he mixes strength with finesse to fire a great drive on the long 5th, giving him every chance of shooting a much sought after 3. 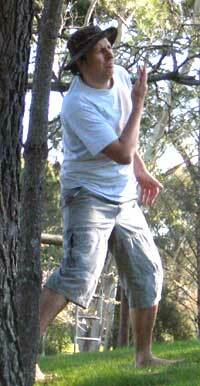 Mene Gene - A Taumarunuian golfer who is residing in Auckland Gene Tutaki plays the forehand with an ease that can only be admired. Classic Third - OK, so we might be wearing this 'Classic Hole' description a bit thin, but ain't the third a classic? Especially watched from behind the basket, looking up at the tee. Here we see Des Cooper walking with satisfaction towards the basket where his surprise 'bomb shot' dropped in from high to make for a relatively easy birdie. Another Trophy Cabinet Renovation Required! 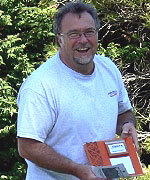 - Simon Feasey (Auckland) accepts 3 trophies from TD Bob Gentil. Looking an all up favourite to win the NZ Tour again with this being his third win this year (his own tournament - this year's Nationals, Auckland's Crater Cup and here), Simon's win in Taupo was slightly different in that he came back from 2nd Group status in the 2nd round to make the first group for the final round. Like the Broncos that evening against the Bulldogs, Simon hit back straight after half time and scores try after try, kicking from the sideline and seemingly loved by the video ref. Hang on, what am I talking about? 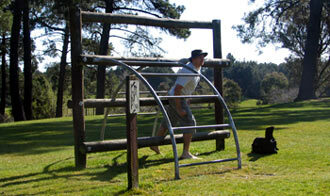 The Bruno Crouch - Bruno Whale (Taumarunui) has had the benefit of growing up around all the various styles of throw. Forehand, backhand, hammer, slammer, ding dang donger - but like any golfer, he had to create his own signature drive. The Brunoe Crouch. Yeah, Ta - And then in true Bruno Whale style, he casually accepts the Junior trophy for the second year running with 62, 63, 62.. Seventh Heaven - Ah, the variety of Spa Park, Hole seven and, like all of us, Paul Cohen (Waiheke) had visions of a birdie at the tee. Now he's trying hard to hold par after being stuck in a tree. Playing From Scratch - or is that With Scratches? 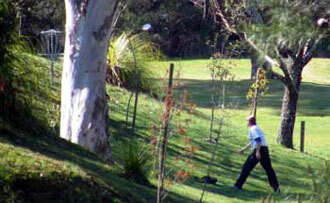 - Taumarunuian golfer Bruno Whale would walk through broken glass to play his shot without penalty. Scary Backdrop - Hole 2 and you are within 4 metres of the basket for a birdie. You just have to ignore the thought of what will happen if you miss the chains all together. Here Baz Keene (Auckland) is onto it to kaching into the basket for 2. Waa? 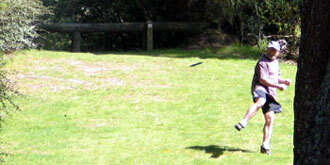 - Just when you think you've seen it all, Bruno Whale (Taumarunui) steps up the first tee and fires a right handed forehand hyzer roller. With a flip. Ozone Free - Juan Unda ensures he is well protected from a very much 21st Century threat to health: there was a warning out on Sunday that the Ozone layer over New Zealand was particularly weak. Naturally, the MegaMexican golfer adjusted his game for the extra UV and fired some quite amazing shots. Lean On Me - Siep Van Vliet (Waiheke) dances the 'don't go there' dance as he tries to threaten the pin on the 13th. Struggling with a crook AC joint in his right shoulder, this golfer has remarkably taught himself to throw left handed - and with powerful precision. Awesome. Line Up, Breathe In, Lean Back, Breathe Out, Bend Knees, Breathe In, Crouch, Breathe Out, Lean Forward, Breathe In, Balance, Breathe Out, Focus, Breathe In, Lean Back, Breathe Out, Bend Knees, Breathe In, Crouch, Breathe Out, Lean Forward, Now PUTT!...DAMN!!! 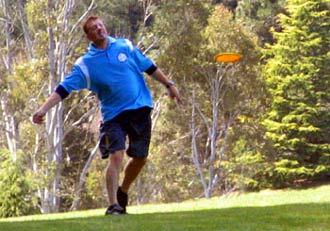 - Paul Cohen (Waiheke) did everything right here on the 13th, but the basket chose to spit back his disc. The Many Faces of Waiheke - Nigel 'Waiheke' Hailstone (Auckland) plays with such conviction that you would swear he sleeps with his discs. 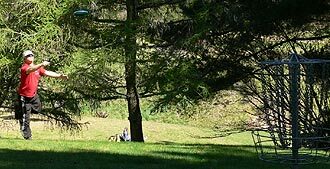 Here he wills his favourite frisbee to the seventh basket for a par. See the pain and despair as it ignores his psychic instructions and flies over the top. Siep Van Vliet Waiheke Isl.